Hello Katie Girl: Paula Dean's Beef Bourbon Y'all! Paula Dean's Beef Bourbon Y'all! Okay, I love Paula Dean. Why? She loves butter and she isn't afraid to admit it. Let's face it, butter makes everything taste better and you can never use too much! This is my cooking philosophy. The woman also dressed up like a giant stick of butter for Halloween one year. I admire that. I found this recipe from Paula which is a twist on Julia Child's beef bourguignon recipe. 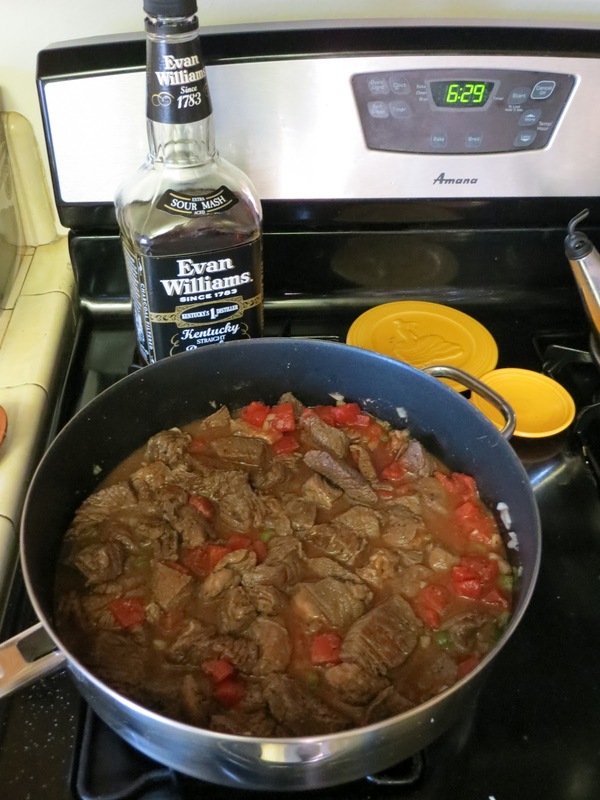 Instead of beef bourguignon it's beef bourbon y'all! Well, it was a delicious and a wonderful stew. As Monsieur Loisel says in "The Necklace" there's nothing better than a good stew. I followed the recipe featured below and added some buttered egg noodles with chopped parsley. My husband, who has become somewhat of an "Bourbonofile" since our Kentuky trip, recommended using Evan Williams Black bourbon for this. We visited this distillery, Heaven Hill, while we were in Kentucky. Anyway, try this recipe! You will not be disappointed. My husband and I have been having it for left overs the last night or so and it gets better every time! Heat the oil in a large Dutch oven or heavy pot with a lid. Season the meat all over with House Seasoning and sear in a single layer. Remove the beef to a plate and add the green bell pepper, onion and celery to the pot and saute until softened. Return the beef back to the pot and add the bourbon, diced tomatoes and enough stock to cover the beef. Bring up to a boil and then lower to a simmer with the lid on ajar. Simmer for 2 hours or until beef is very tender. Then add the corn, green beans and red potatoes. Simmer 10 to 20 minutes until the vegetables are tender. Season, to taste, with salt and pepper. You won't be disappointed! Let me know how it turns out if you try it!